The first quarter exam has already been released in late 2018 and the second and third quarter exams are due to be available in early 2019. Released in late 2018, this single semester exam was designed for the condensed or single semester course. Several new norms have been published. These include Inorganic Chemistry (2014) and Analytical Chemistry (2017). Coming soon Inorganic Foundations 2016 with new or updated preliminary norms available in early 2019 as well. Please consider providing student performance data to us for norm calculations! This second edition of the General Chemistry Study Guide has many more items, a clear alignment to first term/second term courses and common textbooks. 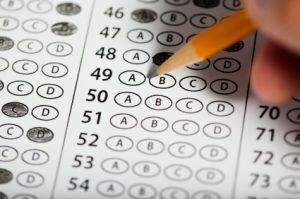 Additionally, there are specific items included for conceptual test preparation. The ACS Examinations Institute regularly seeks Postdoctoral Research Associate(s) for a full-time, 12-month position with benefits that can begin on or near August 1st annually. Applications are evaluated on or before May 1st annually. Click here for more information and application details. If you have just joined the Division of Chemical Education (DivCHED), you may purchase materials from the Exams Institute at a lower cost. This offer is valid for the first 3 months of your initial membership in the division. This offer is designed to help welcome you to the division and introduce you to one key product of the efforts of division members. Price details are below.